Heidlebaugh grows soybeans, and says he will probably lose about 5-6 acres of his crop. “I am in a pretty flat area and not close to any river,” he said. He said the flooding was as bad in neighboring Van Wert County and those farther north. He said he is concerned about disease with all the standing water in fields and lose of large portions of the 2015 crop. In Fulton County, farmer Allen Willson has about a thousand acres of soybeans and more than a thousand acres of corn planted. He said Friday that he is seeing some “yellowing” of the corn because of the standing water in his corn fields, and has lost about 10 acres of his soybeans to the flooding. 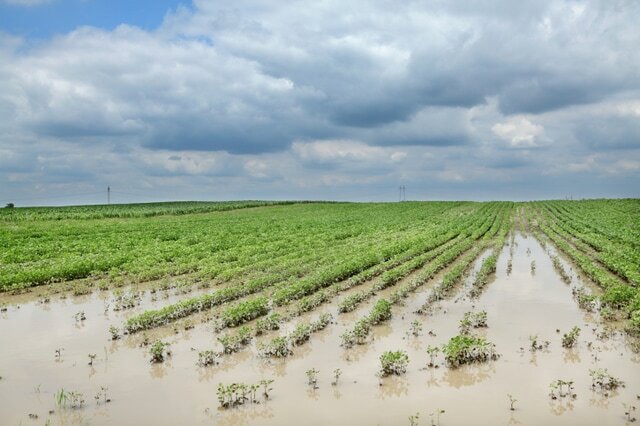 “And if the waters recede quickly and the plants receive some light rain, they can recover, but will probably still experience some yield loss,” Lindsey said. · Poor nodulation: Soybean roots have nodules on them that capture nitrogen that aid in the plant’s growth. Wet soils reduce nodulation and can result in yellow, stunted soybeans.